In this posting, we thought we'd share one of our pet trading ploys. While not exactly astrological, this tactic, like most price chart pattern activity, does indeed fit under the heading "Market Metaphysics." We call this particular price chart configuration the "Rhino." Looking at an example of this pattern, it's clear to see why. This is basically a correction, or downtrend pattern consisting of a peak, a decline to a particular level, a rally that clearly does not reach the heights of the first peak, and another decline to roughly the same level of the first peak's decline. We should have a general profile of a Rhino's head. The first peak is the ears of the Rhino, which are the highest point on its head. The lower second peak is the horn. The two bottoms are the "lipline" of the Rhino's head. The second decline does not always have to go down as far as the first. Actually, a higher bottom on the horn is quite bullish. Sometimes the Rhino has two horns. Ok, Ok, what we have here is essentially a triangle. If price declines below the lipline, or triangle support, we sell, or go short. If price breaks out of the downtrend line connecting the ears and horn (upside breakout) we go long, or add to positions. Simple. If we extend the lipline that connects the two bottoms forward into time (and space), and continue the descending ear/horn downtrend line forward as well, we create an apex where they bisect which is very likely to tell us when on the chart in future the price movement will top out (or bottom, as the case may be). Long strategies seem to be most consistently successful with Rhinos. Upside breakouts give fewer false signals than the downside variety. With this method, you could teach a kid to trade. In fact, if you have trouble imagining this pattern, find a kid. 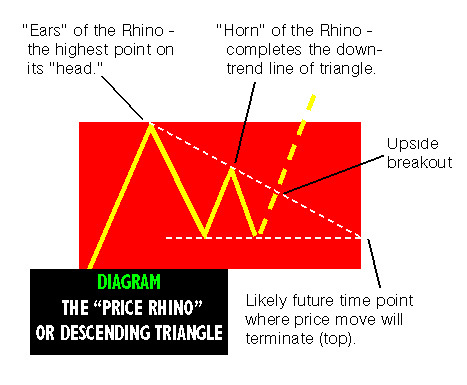 Anyone under seven years old who's been to a zoo and can talk should be able to print out a Rhino on a price chart to those of us who are graphically challenged. We just wouldn't advise you hanging around schoolyards with an SRC Bluebook of Monthly Charts inside your trenchcoat whispering "Hey, kid, wanna see a Rhino? Extrapolating on the current theme of younger and younger fund managers, one of our dreams is to create a fund run solely by little kids looking for Rhinos in price charts. We figure that as soon as little Janie can read the numbers on a micro-cap balance sheet, she's out the door. When little Tommy starts telling us how cool his new video game software is, and can he buy the stock, he's history. The really good thing about hiring kids to run money is that they haven't gotten MBA's yet. We did a very sloppy, informal survey of dozens of Rhinos in fairly common, everyday stock price charts and came up with a conservative average percentage gain on upside breakouts of around 25 percent within an average time window of 6 months. Suffer the little children to come unto us. The most valuable and dependable Rhinos are in MONTHLY charts. They usually presage big moves. But Rhinos, like any fractal, can appear in any size and time frame. Our Rhino hunting discloses occasional trophies you may want to take a shot at, and in future "Rhino Alerts" we'll share them with you from time to time. Perhaps the most significant such beast these days for market players has been the Treasury Bond Rhino. CHART A shows the monthly Rhino formed from the turn of '96 to the Spring of '97. The "Ears" of this Rhino peak at the beginning of '96, while the "horn" peaks at the end of '96. The decline from the tip of the horn reaches support in early '97. The price triangle in place, aggressive speculators could have taken initial probing positions at that time. 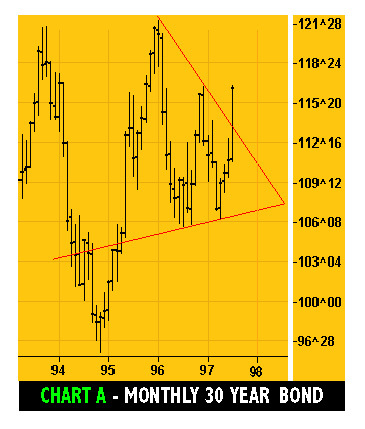 Holdings would then have been enlarged at the breakout from the overhead downtrend line in mid '97. CHART B, a weekly chart of further action and more intimate detail discloses the classic "return move" back to the downtrend line that was broken earlier. This is a case of old resistance becoming new support. After a brief, compact consolidation at this stress line, bonds have resumed their merry climb. 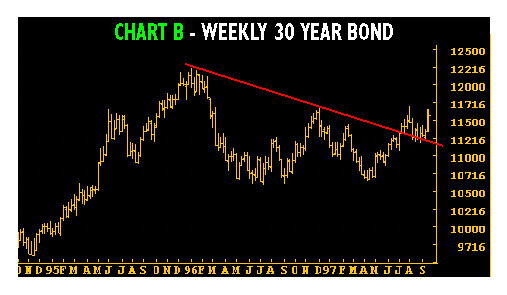 It is not unreasonable to expect that bonds can now challenge the '96 highs. Such a dramatic decline in interest rates bodes well for continued support of the stock market, if not a push to record numbers. Yes, we marvel too, but the Rhino is bulling ahead nevertheless. The ability of the financial system to absorb the 9% increase in money supply over the past year alone without signs of "inflation" is both encouraging and disturbing. Encouraging for bulls who have no reason to abandon the game while bonds are rising, and encouraging for a government still sadly in deficit that must finance its indulgences with cheap money. It is disturbing inasmuch as one must question the underlying weakness that allows such increased paper credit money supply to progress without undue stimulation. Stimulation must come, otherwise those who are warning of deflation may prove to be right. And if and when stimulation does come, this current generation of traders and investors may be treated to the "stop/go" monetary policies of the later 1960's and 1970's. It is not inconceivable that gold will follow along with bonds and stocks in short order. Generally there comes a time in every secular or cyclical business expansion when all the asset classes are rising simultaneously. Bonds invariably lead the way, with lower interest rates stimulating purchase of stocks in anticipation of better business conditions ahead. Finally, gold rises as the economy goes into overstimulation. Then bonds top, stocks follow shortly afterwards, and finally gold peaks as well. In this cycle, perhaps gold's moment was to be in '96 and '97, but central bank selling has kept the price heavily dampened through all of this. Soggy might be a better description. It is as though if gold could only be kept out of the house, the party could continue to go on all through the night. That is the bad news. The good news is that this pressure on gold has put the price into a giant long term Rhino (CHART C). 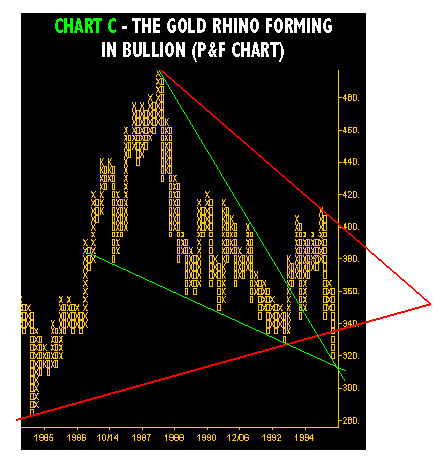 We first discovered the Rhino pattern in gold bullion prices, then began to see it everywhere. How fitting that the shiny yellow is now tracing an enormous Rhino that sprang into being at the resurrection from the 1985 lows. These lows have not been violated since, and until they are, gold is technically in, or building a base for, another wave up in the monster bull market begun since all currencies have been detached from the integrity and responsibility of gold backing. Gold's plunge below the red support line of this triangle is not particularly encouraging. But this may prove to be an aberration brought on by the manipulation of central bankers. The green stress lines of support and resistance that converge to support the current gold price will require forcefully renewed selling by central banks to break. Industrial demand for gold is particularly robust, and for every ounce sold there is that same ounce bought. Over time, someone will be proven very wrong. Traders and investors caught in the undertow of these impressive, but nevertheless "intermediate" moves, may be scratching their heads and wondering "what gives?" It could very well be that if and when gold breaks above the red downtrend line of this Rhino, the answer might be "the entire financial system."